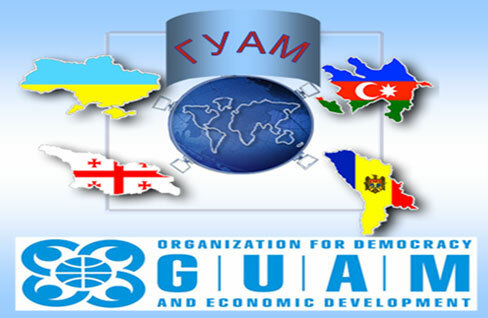 GUUAM (Georgia, Ukraine, Uzbekistan, Azerbaijan and Moldova) Group was formally founded as a political, economic and strategic alliance designed to strengthen the independence and sovereignty of these former Soviet Union republics. During the first five years of cooperation GUUAM group became an important structure, which looking to enhance regional economic cooperation through development of an Europe-Caucasus-Asia transport corridor. It has also become a forum for discussion on various levels of existing security problems, promoting conflict resolution and the elimination of other risks and threats. Cooperation among delegations of Azerbaijan, Georgia, Moldova and Ukraine started in 1996 in Vienna, Austria, at the CFE Treaty Conference, where four states issued joint statements and proposed common initiatives. On October 10, 1997, the Presidents of Azerbaijan, Georgia, Moldova and Ukraine met in Strasbourg during summit of the Council of Europe and stated their mutual interest in developing bilateral and regional cooperation, European and regional security, political and economic contacts. In the Joint Communiqué issued, the Presidents stressed the importance of the four nations cooperation in establishing a Eurasian, Trans-Caucasus transportation corridor (TRACECA), and underscored the importance of strengthening the four-lateral cooperation "for the sake of a stable and secure Europe guided by the principles of respect for the sovereignty, territorial integrity, inviolability of state frontiers, mutual respect, cooperation, democracy, supremacy of law and respect for human rights." The leaders of the countries agreed to undertake joint efforts in order to overcome the difficulties that Europe faces on the threshold of the 21st century. On April 24, 1999, GUAM was enlarged by one more member - Uzbekistan, who joined the group at GUUAM summit, which was held during NATO/EAPC Summit in Washington D.C., on April 23-25, 1999. On September 6, 2000, at the meeting in New York in connection with the UN Millennium Summit, the Presidents of GUUAM countries pledged to intensify multilateral cooperation within the framework of GUUAM by giving it a multilevel character. To this aim, it was deemed expedient to convene regular summits at the level of Heads of State at least once a year, and meetings at the level of Ministers for Foreign Affairs at least twice a year. The Committee of National Coordinators (CNC) shall hold regular sessions on a quarterly basis. To foster favorable conditions conducive to economic growth among the participating states, mutually beneficial trade relations, and implementing complex multilateral programs and projects in the fields of production, commerce, energy, transport, the economy, international credit and financial cooperation, border, customs and fiscal services, communications, science, technology education and culture, direct contacts between different state bodies and departments of the respective agencies of the GUUAM Group Member States will be established. There are joint decision of GUUAM states to promote development and improvement, at different levels, of mechanisms of multilateral cooperation in the framework of GUUAM, including at the level of the executive and legislative branches, business circles, non-governmental and humanitarian organizations and mass media. GUUAM countries also agreed to strengthen and improve the mechanisms of consultations and coordination of actions within the framework of international organizations, and to promote actively the practice of joint statements at various levels. Although the agreement initially included a declaration of mutual defense, Moldova has since declared its disinterest in participating in any GUAM-based mutual defense initiative. Moldova has been involved in information exchange, trade and transportation, border control, and energy projects issues within this regional agreement. The years since 2005 have seen significant developments in Moldova's relations with the West. The September 11 terrorist attacks served as the main catalyst for Uzbekistan's decision to suspend its GUAM membership. In particular, Tashkent's interest in the security aspect of GUUAM declined after September 11, when the Uzbek government forged a bilateral security relationship with Washington. In December 2001 Uzbekistan hosted the summit of the Central Asian Cooperation Organization. The group is the second CIS organization after GUAM in which Russia plays no role. Officials from Georgia, Ukraine, Azerbaijan and Moldova convened in the Black Sea resort town of Yalta on July 19-20, 2002 to perhaps make one final attempt at forging a viable free-trade zone. Additional topics expected to be addressed at the Yalta gathering include the establishment of a GUAM-European Union business forum, combating organized crime, anti-terrorism measures and "aggressive separatism." Among the participating states, Azerbaijan seems most interested in GUAM future. Azerbaijani Foreign Minister Vilayat Quliev suggested that the Yalta summit would "expand economic ties among the countries". In 2006, the organization's members voted to change the name to the Organization for Democracy and Economic Development -- GUAM. At the GUAM summit to be held in Kyiv on May 22-23, 2006 the heads of state of Georgia, Ukraine, Azerbaijan and Moldova (GUAM) signed an organizational agreement, The Organization for Democracy and Development-GUAM, which contains founding documents for new international and regional principles established by GUAM. The Eurasia Foundation Kyiv Regional Office and the Foreign Policy Research Institute at the Diplomatic Academy of Ukraine announced the launch of a project: the "Institutional Development of GUAM through Independent Analysis, Monitoring and Advice" at the Summit. An agreement among governments of member states of the Organization for Democracy and Economic Development GUAM (Georgia, Ukraine, Azerbaijan, and Moldova) on international multimodal cargo shipment by two or more kinds of transport was signed in Baku on June 19, 2007. The governments of GUAM have committed to facilitate the development and competitive capacities of multimodal shipment. The governments also agreed to transfer customs clearance of goods from border checkpoints to terminals of shipment. On 1 July 2008 in Batumi, Georgia, the third GUAM-Japan meeting was held within the framework of the third Summit of the Organization for Democracy and Economic Development - GUAM. Both sides exchanged views on various issues of mutual interest, including energy, transit and transportation, environmental protection, trade and investment, and tourism as well as peaceful resolution of conflicts on the basis of the UN Security Council resolutions.